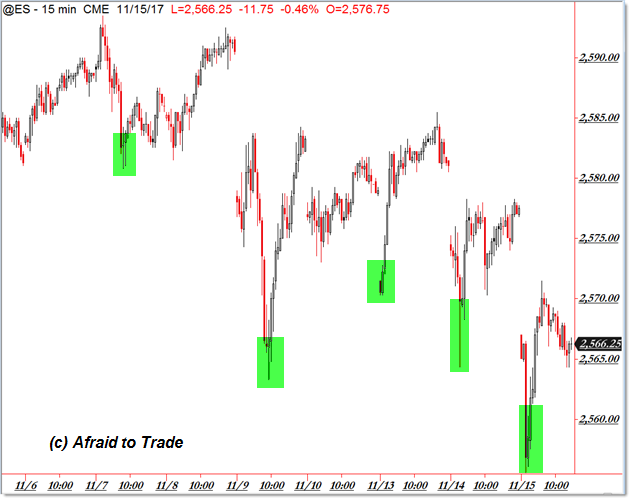 From Corey Rosenbloom: As an intraday (or short-term) trader, we do best when we recognize repetetive price patterns and frame each trading day by what’s happened in the recent past. For now, we’re seeing a stabbing bull gore the active bears intraday while price trades lower. Of course, if you are an intraday trader, you might have NO IDEA that price is actually retracing or declining in a sell-off on the Daily Chart. From the peak near 2,600, SELLERS have actually been winning the WAR while BUYERS have been winning every single BATTLE. In other words, price is indeed selling off from 2,600 toward the lower targets on the Daily Chart near 2,550. While the Daily Chart is the recent short-term war, the intraday chart is each battle. Note how price sells-off rapidly either overnight or right off each day’s open. From there, buyers reverse course on a program/algorithmic V-Spike Reversal pattern which results in a bullish rally – even TREND DAY (style) – into the close. It’s almost like Bears achieve victory in the darkness of night but are driven back by the Bulls when the warm light of morning emerges. Are bears therefore nocturnal vampires? Humor aside, this is the repetitive pattern that holds sway over our current short-term market. The SPDR S&P 500 ETF Trust (SPY) rose $1.04 (+0.41%) in premarket trading Thursday. Year-to-date, SPY has gained 15.78%. SPY currently has an ETF Daily News SMART Grade of A (Strong Buy), and is ranked #1 of 136 ETFs in the Large Cap Blend ETFs category. This article is brought to you courtesy of AfraidToTrade.com.